by Kingsley Onyemekara Emecheta et al. by Michael B. Aleyomi et al. A peer-reviewed International Journal of Afro-Asian Studies (IJAAS) presents a scholarly account of studies of individuals and societies in Africa and Asia. Its scope is to publish original research by social scientists in the area of anthropology, sociology, economics, political science and related social sciences about African and Asian societies and cultures and their relationships. The journal focuses on problems and possibilities, past and future. Where possible, comparisons are made between countries and continents. 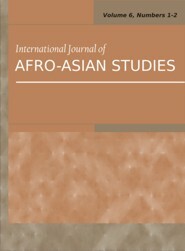 The Journal follows the recent move in the scholarly academy to allow interdisciplinary analysis to bridge the traditional divides that reflect the specialization of academic knowledge to the detriment of actual cultural and social processes and provides rich, progressive, innovative directions in Afro-Asian studies and invigorate the status of current thought on interracial encounters across multiple disciplines.